In 1685 the wealthy Cornish merchant and that year’s lord mayor of London Sir Robert Geffrye (also spelt Geffery, and sometimes even Jeffrey) donated land for almshouses on Kingsland Road, at a site that was then considered the north­ernmost tip of London. Funds to actually build the almshouses weren’t forth­coming until Geffrye left money for this purpose in his will and the homes were completed in 1715 by the Ironmongers’ Company, probably to the designs of the builder, Robert Burford. The layout took the conven­tional form for almshouses of that period: two-storeys on three sides of a square – with a taller chapel in the centre, surmounted by a pediment and cupola. A recre­ation space called the Victoria Room was tacked onto the southern end in 1897. The front garden was planted with lime trees, most of which were replaced by London planes in the late 19th century. By the early 20th century the Hoxton end of Shoreditch had become an overcrowded and insan­itary quarter, and the Ironmongers’ Company decided to sell the almshouses and build new ones in Mottingham, a locality that has since been absorbed within south-east London. They later moved again, to Hampshire. A campaign by leading members of the Arts and Crafts movement persuaded the London County Council to convert the old buildings into a museum of ‘cabinet making and kindred arts’ – which were long-estab­lished trades in Shoreditch. Re-created domestic interiors were a feature of the museum when it opened in 1914, and they have since become its star attraction. A sequence of period rooms and related displays of furniture, textiles, paintings and decor­ative arts serve to illus­trate changes in society, behaviour and style over the past four centuries. One of the almshouses has been restored to its original state and can be viewed on limited occasions. In the 1990s a new wing was added in the south-east corner, with a glazed link to the main range. 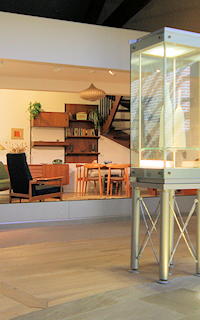 Shaped like a squeezed horseshoe, the extension contains the museum’s 20th century displays, a classy café and subter­ranean activity rooms for children (the Geffrye has been putting an emphasis on parti­cip­ative education for decades). Behind the museum there’s a walled herb garden and a series of four period gardens. These are open from April to October. Various special events and exhib­i­tions are organised indoors and in the gardens – some free, some not. Every year from late November to early January the period rooms are given a festive makeover to show how Christmas has tradi­tionally been celeb­rated in English middle-class homes. 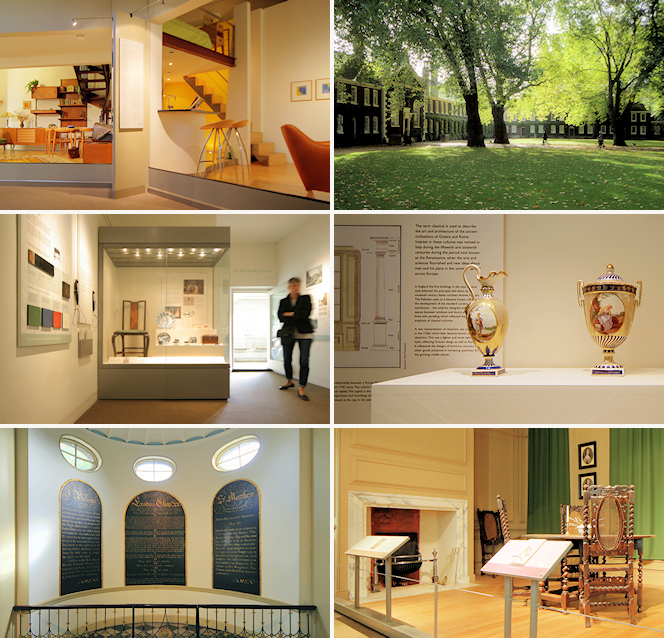 On 7 January 2018 the Geffrye museum closed for a “trans­form­a­tional” £18m devel­opment project that will take almost two years to complete. Throughout the closure the museum will run a programme of events and activ­ities in the front gardens – and the restored almshouse will be open for tours on selected dates.